If you are hitting the pavement in search of a new job, you might realize how similar it is to trying to sell a car. You want to put your best features forward, but instead of discussing the mileage or the horsepower, you have your own personal skills to help attract investment from employers. Read our guide to learn how to include general, industry-specific, and computer skills in your resume. Or, take advantage of our resume builder’s ability to automatically generate skills specific to your industry! What is a Skills Section? What Skills Does the Job Require? What if You Don’t Have the Required Skill? Formatting Your Resume: Where Should You Place the Skills Section? 1. What is a Skills Section? Obtaining a skill that the employer needs shows perseverance and a good work ethic. Proving that this skill benefitted your last company shows that you can be a team player and a valuable asset. The skills section, often referred to as “Additional Skills,” is the place in your resume where you list all of the useful abilities that can’t be easily seen in the bullet points of your Work History / Professional Experience section. When potential employers read through your resume, the employer will ask themselves these questions about the skills you list. How did you learn the skill? What benefits did the skill bring to your company? What examples prove your proficiency of the skill? This is not the place to show what skills you hope to have or are currently learning. If an employer sees a skill listed on your resume, they will expect you to be able to deliver on that promise. Before you jump into writing down all the amazing talents you have, let’s learn a bit more about what skills employers typically look for on a resume and see if you can include any. There are two types of abilities to put on a resume: hard and soft. Hard skills are the actual qualifications an individual needs for the job. They are teachable abilities that you can easily quantify. Soft skills, on the other hand, are not easy to quantify. These are the interpersonal abilities that make you an appealing person to work with and show how you will engage and interact with your work environment, including your boss and co-workers. 3. What Skills Does the Job Require? Sure, it’s great to have a long list of abilities for an employer to gawk at, but the most important part of the skills section is not showing how great you are, but, more specifically, how perfect you are for the particular position. You will do this by having a skill set that aligns with the job requirements. If you can do that, an employer will definitely notice. If you do not have every skill in the job description, it is not the end of the road for you. First, read through the job description and take note of all the skills that are necessary. There is usually a list of both hard and soft abilities, that an ideal candidate should possess. However, this does not mean you need to possess every single skill listed in the description. If you happen to have all of them, then good for you! If there are some that you need to improve on or gain entirely, don’t worry. There are ways of setting up your skills section that can still show you in the best light. Now that you’ve reviewed some of the most popular skills employers look for on a resume, it’s time to tailor the list in your section to the position you want. As you go through the list above, make a separate list with the ones that you already possess. Try and order your personal list of abilities by your level of proficiency, and separate them into hard and soft. The closer your list of skills matches the skills needed for the job, the better your chances are for getting the job. How many skills do you have in common with the job description? Do you have any of the most essential ones the job requires? Do you possess any that are necessary for this job? Do you need any of them to get this job? Employers want to know exactly what skills you have. Be specific by saying which software, hardware, or tools you can use. By answering these questions, you can gauge where you are in terms of hireability. Obviously, the closer your list matches the skills needed for the job, the better your chances of getting the job. However, if you do not have every skill in the job description, it is not the end of the road for you. Employers are looking for specific examples that prove your competency, and one way to do this is to replace nonspecific adjectives with hard examples. Basically, be specific every chance you can. Even if you are discussing things like software, hardware, and other tools you are skilled with, be sure you list each one out. Don’t Say: Excellent computer skills. Do Say: Proficient with Microsoft Word, Excel, and Powerpoint. Don’t Say: Talented graphic artist. Do Say: Experienced graphic artist well-versed in Adobe Photoshop, Illustrator, and Sketch. Check out our comprehensive list and guide for more details on how to use resume adjectives! Doing this will greatly help make your resume more Applicant Tracking Software friendly. An ATS is a resume reading robot that many large and medium sized firms use to automate, streamline, and manage the hiring process. It counts the number of role-related keywords you have on your resume, and determines if you are a match based on what the software finds. If you happen to forget to add these specific skill keywords, you’re hurting your chances. A hiring manager will be looking for skills that are the most relevant to the job at hand. 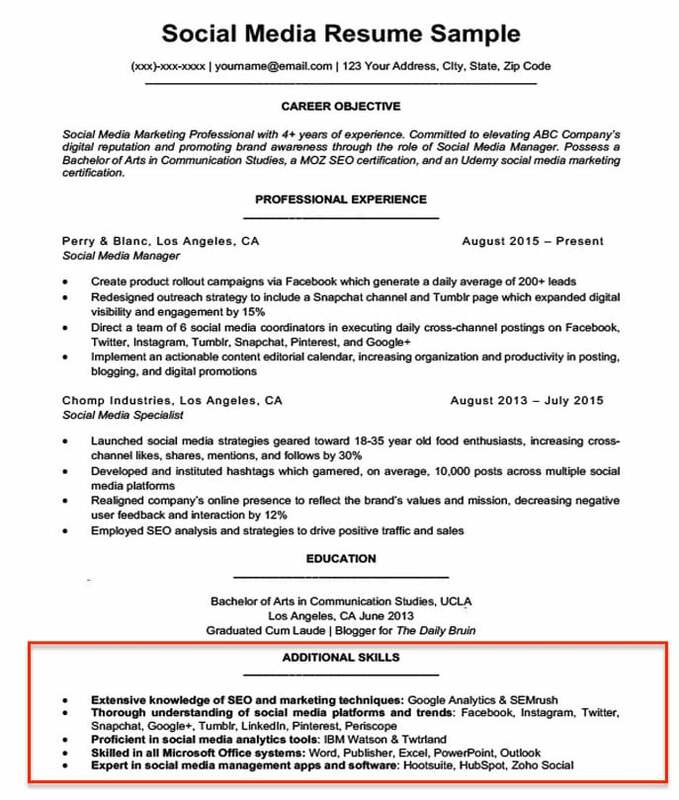 This is why it’s important to tailor your resume appropriately. They do not care if you won the spelling bee three years in a row. All the abilities you put on your resume should, in some way, relate to the position. Take my work home too often and get in trouble with the spouse. Work diligently until the end of every project. 6. What if You Don’t Have the Required Skill? We have discussed how to choose the abilities you want to include in your resume, but what if you don’t have any experience with some of the essential ones in the job description? If you have read through the job description, and you have realized you don’t have some of the core competencies in order to do the job, this is the moment where you really consider if you are capable of doing the job. For example, if the position you are applying for is for content marketing, but you have never written online content, perhaps you need to find other jobs that suit your skills. You can still use the advice from above and explain to employers where you need to grow, but you need to make sure this area of growth would be possible alongside performing the core components of the job position and are not core components themselves. Deciding where to put your skills section in your resume depends entirely on which kind of job you are applying for. 7. Formatting Your Resume: Where Should You Place the Skills Section? There are a few different types of skill sections and formatting options that you should consider when crafting your resume. The placement of this section is also a very important thing to consider. You’ve just spent all this time creating and optimizing your skill section; it would be shame if this list was not put into the best place to showcase it. So where’s the best place to put this section on your resume? There is no single answer to this question because where you put your skills on your resume depends entirely on what industry, company, and position you are applying for. There are a few different types of skill sections and formatting options that you should consider when crafting your resume. Read through each of these options to see which one works the best for the position you are applying for. It is most common for resume samples to have the “Additional Skills” section toward the bottom of a resume. This would be appropriate for jobs that value your past experience most. If that is the case, the hiring manager is going to put the most weight on your Work Experience. By leading with your past experience, it will be easier for the hiring manager to gauge your competency for the position. You don’t want them to get confused when they are looking for the most essential information they need. A Key Skills section, on the other hand, is listed at the top of a resume. This is the best option if you want to showcase your abilities and lead with your strengths. For example, if you believe your skill set is the best way for you to get hired for a position, perhaps because your work experience might be lacking, it would be smart to put this section first. Even if you do have the appropriate amount of work experience, listing your skills at the top of your resume is a clever way of showing the employee your unique capabilities and strengths as an individual. If you are applying for a position that requires a very specific set of skills like a technical or engineering job, then the employer will likely want to see that you have the proper hard abilities first. In this instance, you would want to put your list of abilities toward the top of your resume underneath the resume objective or the qualifications summary statement. The most important thing to take away from this is selecting and understanding the appropriate abilities for the position. Regardless of where you include your skills section on your resume, you can be assured that the hiring manager is going to find it and definitely going to ask about it. It’s best to be prepared! If your section is longer than 2 or 3 bullet points, you want to consider the order in which you list them. A hiring manager will take notice of nicely organized bullet points and, on the same coin, information that seems out of place is also very noticeable. 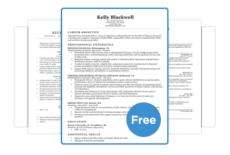 If you have further questions about how to use bullet points and other stylistic elements, our free comprehensive guide for structuring a visually attractive resume is a great free resource at your disposal. One way to keep your bullets organized is to group your skills into groups such as, computer, communication, and language. Doing this will help the hiring manager process your resume efficiently. Now that you have all the tools you need to craft the perfect skills section, download one of our free templates and get started on your resume! Or, if you’re feeling a bit overwhelmed, our resume builder can help you automatically generate skills, professional experience, and career objectives specific to your industry! 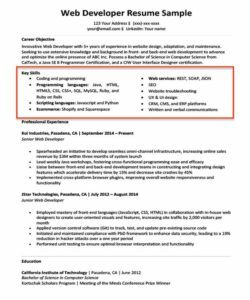 I want apply for IT sector related jobs, plz help to write my resume.